What's a Kid to Do in Chatanooga? Why not try the Creative Discovery Museum? The museum is one of three recipients of the 2005 Universal Design in Learning Award. The award is offered by Arts in Action which explains, "The award provides financial support to children's museums to support new or existing programs, exhibits, or initiatives that demonstrate best practices and innovation in the implementation of Universal Design Principles." Ayala Rahav @ Senior Touch Ltd.
" We focus on product usability and the extent to which the product can be used by older users "
Cruise lines and water-based touring companies face design questions that are unique to their situation. A thorough rethinking of ship design and water-based travel products is in order using the principle of Universal Design. Here is a report on First Travel's new 'Hong Kong Dragon Cruise'. While they have not undertaken such an integrated approach they have acknowledged some of the basics. Continue reading Hong Kong's Dragon Cruise. But Gabriel Balirac, Galician blogger in Jorge Gobbi's "Blog de Viajes" style, wants us all to know that rural tourism is alive and well in the far north of the Iberian Penninsula. Plans to enshrine disability discrimination at the Taj Mahal have succeeded through the use of religious metaphors. Surely, arguments can be made that the design mistakes in the Taj Mahal might better be solved by something other than a hydrolic lift that is aesthically at odds with the harmony of the building originally constructed as a mausoleum for Arjumand Bano Begum, later to be known as Mumtaz-Mahal. But the deeper question has to be asked, as was done by the U.N.'s section on World Heritage Sites, "What is the meaning of such architectural "harmony" when it is a manifestation of social exclusion and a barrier to access?" Plan for introducing a specially designed hydraulic lift inside Taj Mahal to allow people with disabilities to visit the inner platform has been shelved as it may destroy the monuments' sanctity says C. Babu Rajeev, Director General of Archaeological Survey of India (A.S.I. ), in conversation with Parvinder Singh. Continue reading Disability Discrimination at the Taj Mahal Employs Religious Metaphors. 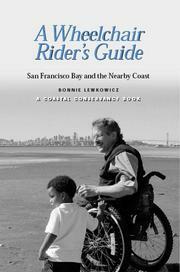 The Coastal Conservancy is sponsoring a book signing for Bonnie Lewkowicz's new book, A Wheelchair Rider's Guide: San Francisco Bay and the Nearby Coast. Tuesday, May 9, 2006, 11 a.m.
A Wheelchair Rider's Guide is a guidebook to wheelchair-accessible parks, trails, and beaches along the bayshore and coast is now available. Bonnie is the founder of Access Northern California specializing in advocacy and education to bring accessibility to the recreation and tourism offerings of Northern California. Continue reading Wheelchair Rider's Guide. Rural Tourism is a growing phenomenon worldwide. Sometimes it is haphazard. It has been entertaining to watch the fortunes of the state of Wyoming fluctuate with the whims of Hollywood -- "Brokeback Mountain" and "City Slickers" each contributed their share. Other times it is supported by a substantial policy infrastructure. 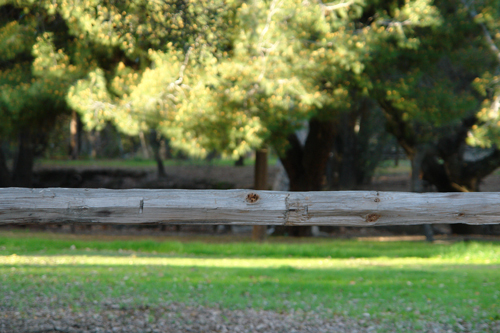 Agriturismo is a serious tourism endeavor in Italy. Try Agriturismo.net (selecting the box for "Disability Access") for a glimpse of just how developed this niche is there. Free - there will be a sign language interpreter and descriptive narrator for the panel discussion. Join Marca Bristo, president and CEO of Access Living; Valerie Fletcher, Executive Director of Adaptive Environments; Coco Raynes, president of the multidisciplinary design firm Coco Raynes Associates; and Rebecca McGinnis, access coordinator at the Metropolitan Museum of Art and universal design scholar, as they discuss the innovative ways universal design principles have been applied in cultural institutions. While much of the press that is easily available to me here in the US emphasizes the near ubiquity of Universal Design in new home construction and in remodeling this piece by Vivek Sabherwal tells the rest of the story. Universal Design is global good sense. The Chiricahua Park area was once home to the Chiricahua Apache Indians and their leader, Cochise. The rock formations are dramatic. The Park Department offers a page on accessibility. Continue reading Homeland of the Chiricahua Apache Indians. Continue reading Pauline Hephaistos Access Survey Projects. From my perspective, UD is emerging into the mainstream market. There is a common misconception that UD is a way to comply with the Americans with Disability Act Accessibility Guidelines. UD, however, is not just for people with disabilities or people who are elderly. UD is human-centered design. It can alleviate many of the housing problems wheelchair users have been facing for years. These homes need not look geriatric or hospital-like. They can be homey, spacious, and welcoming for all. Continue reading Universal Design Living Laboratory. Daylighting is the simple practice of using available light resource through design in order to create a more human-centered environmentally responsible built environment. You can read here about the approach of the Daylighting Collaborative and see its member organizations here. The "Federation for the Integration of the Handicapped" (sic), a group in Ticino, Switzerland, has done an accessibility audit that is useful for visitors. You can see a report at James Martin's About.com site -- Europe for Visitors. Thursday, May 9 is the launch event of the "European Network for Accessible Tourism" (ENAT). The European Network for Accessible Tourism is sponsored by nine founding organisations, including VisitBritain, The Hellenic Ministry of Tourism, Fundación ONCE and accessible tourism specialists from Belgium, Greece, Ireland and Sweden. The European Commission is also supporting ENAT in 2006 - 2007 with a grant from its budget line for "Transnational Pilot Projects for Mainstreaming Disability Policies". The AMTAK Empire Builder run from Minot, ND to Minneapolis, MN covers a lot of prarie in its 9 + hour run. Some of the landscape may be quite interesting - maybe even colorful once the spring growth takes hold. I wouldn't know. The route is an overnight run. Tonight there was a trace of Aurora Borealis arcing along the northern horizon -- an animated curtain of filmy white looking like a waterfall in the sky phasing in and out of focus. Continue reading Northern Lights Spotting. Ngoragora Caldeira is the spectacular remnant of an act of volcanic self destruction. How accessible is this wildlife-packed zoo-in-the-wild? The site, Tanzania Web, lists these lodges available along the caldeira rim. Maybe a ballon ride over the Serengeti instead? I have not flown out of Nagoya's Centrair Airport but their web site indicates that they now what the issues are for travelers with disabiities. For a look at what infrastructure Japan has in place for travelers with disabilities look at Trang web cá cược trực tuyếnthis Centrair page. This conference sought to bring the government service providers, stakeholders and user groups on one platform to address the concern of senior citizens and persons with disabilities. Five international experts also addressed the conference. Of them Ling Suen of the International Centre for Accessible Transportation, Canada recommended enactment of a National Transportation Act in India like that in Canada besides a complaint resolution mechanism and redress system to make the roads, buildings and other public places more accessible to the elderly and the disabled. Divi Resorts offers accessible scuba. Road & Travel Magazine reports on a January 2006 tour sponsored by Craig Rehabilitation Hospital held at Cayman Brac near Cuba. Consultant Makoto Nakazawa has the right idea -- and a list of accomplishments to prove it. The Barrier-Free Company takes seriously the tourism potential of seniors. Susan Fornoff Captures the Dilemma in "Age of Denial"
Meri-K Appy can't forget the look on the face of her neighbor, a fit and athletic Baby Boomer, who reacted to the phrase "grab bars" as if someone should have bleeped out the two seemingly innocuous four-letter words. Read Age of Denial for a look into why it is so essential to differentiate between "accessibility" and Universal Design. Sooshin Choi is on target. Have you ever had a song stuck in your head for hours? For days? A Buddhist meditation instructor once explained to me that it has to do with failure to be in the present moment. I plead guilty to lack of mindfulness lately. (Is that mindlessness?) Chalk it up to all the hours in the air recently (and more tomorrow.) Apparently that has left me victim of the latest unbidden mantra. It is a line from one of my favorite movies -- Bye, Bye Brazil. The line is, "Para Vigo me voy!" Maybe, I thought, I could exorcise this phrase by answering the question, "Where in the Sam Hill is 'Vigo' anyway? 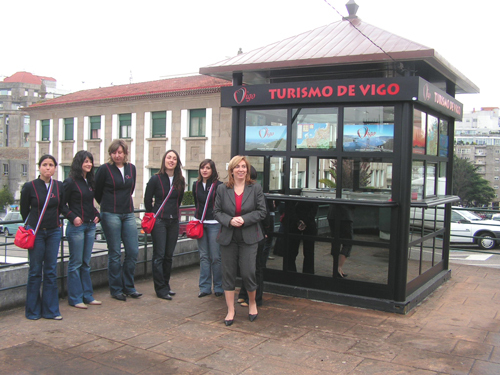 Continue reading Vigo in Galicia. The U.S. Department of Transportation (DOT) issued a notice on February 27 to amend its ADA regulations. These regulations cover policies and practices by transit operators as well as detailed criteria for transportation facilities and vehicles. Continue reading The US Department of Transportation DOT Proposes Amendments to its ADA Regulations. The staff of the Turtle Mountain Heritage Center would like to help you plan your next vacation to the Turtle Mountains. If you need travel information, lodging information, or other information, contact us. We can also conduct tours of the area by special appointment. We look forward to seeing you soon! It's 32 degrees Fahrenheit there at the moment but I'm going to take them up on the offer the day after tomorrow. Continue reading Turtle Mountain: Off Season Tourism. Congratulations to Green Place Flat & Residence in S?o Paulo, Brazil. Situated in the city's hospital district Green Place has adopted Universal Design retrofitting for the specialized niche, "medical travel" that is not often discussed in the Rolling Rains Report. Medical travel is somewhat under reported among those who champion inclusive travel. This is partly because the medicalization of disability stands in fundamental opposition to modern disability rights and self-determination movements. Similarly, in the field of aging, the dominance of medical intervention marks the diffence between the Golden Age of the "Third Age" and the medicalized "Fourth Age" of denoument. However, serving travelers with disabilities in such a favorable location, Green Place in S?o Paulo may succeed in demonstrating best practices to be emulated through the industry. Continue reading Hotels Club News Reports on "Medical Travel" in Brazil: Green Place Flat & Residence. Green building & Universal Design go together. In commercial building Universal Design & LEED certification go hand in hand. In home design and remodelling Boomer UD retrofits fill the news as do industry stories on energy efficient smart homes. So it is encouraging to see travel industry organizations such as Green Globe 21and ICTP partner with innovative businesses such as Green Global Village and Mondial Energy. Alex Winch, President of Mondial Energy Inc. announced an alliance with Green Global Village to target the tourism sector with Mondial’s innovative solar financing mechanism. Winch said that Mondial has developed a financing structure that allows for no capital outlay, low operating cost energy solutions using high quality equipment and long term, stable energy prices. The link with tourism – one of the world’s largest and most energy reliant sectors – opens up immense market opportunity. He added that it would also help the tourism industry do the right thing at the right time for global climate change solutions. ITHACA, N.Y. -- A melody of staccato piano notes sings out from the speakers of Victor K. Wong's desktop computer. But it is not a melody made by Bach, or Liberace, or even Alicia Keys. It is the melody of color. Wong, a Cornell University graduate student from Hong Kong who lost his sight in a road accident at age seven, is helping to develop innovative software that translates color into sound. "Color is something that does not exist in the world of a blind person," explains Wong. "I could see before, so I know what it is. But there is no way that I can think of to give an exact idea of color to someone who has never seen before." Continue reading Hearing Color - Navigating the Sky. Pat Ferrier, writing in the Coloradan, tells an interesting story - with a bit of edge - on the impact of visitability while making appropriate distinctions between disability, handicap, universal design, and accessible design. (But note Visitability founder Eleanor Smith's notes below. *) Read Homes for All Abilities. The piece is reminiscent of the warning issued post-Katrina -- "Will We Learn From Our Mistakes?" Here is another good piece. This one is by Maureen St.Hilaire and published in the Arlington Advocate. And one by Kimberly Seldon of Design for Living. As Universal Design continues into the mainstream publications like MSN (first article) make mistakes like confusing it with accessible design. Continue reading Recent Articles on Universal Design. Paris on a Quad Bike? The Independent sends a travel writer four wheeling through the streets of Paris on a "quad bike." Rather than spoil the surprise, and to encourage you to become familiar with the work of the Open Doors Organization, follow this link to summary results of the 2005 survey of top US travel destinations for people with disabilities. While there, explore the site taking a look at some of the work done by Laurel van Horn who has lso co-authored, with Jose Isola, an excellent history of inclusive travel that Review of Disability Studies is inexcusably late in publishing. Work takes me to Tucson, Arizona. The famous Tucson Gem & Mineral Show having ended in February lodging is not hard to find. Saguaro cactus and desert plant life beckon.